Enormous backlit dazzlingly bright hyper-colorized scenes of bustling Hong Kong streets gild the walls and stand in contrast to the unpretentious furnishings of this informal Brooklyn café. The youth-centric menu is extensive – a trifold glossy sheet that opens to a 25½ x 11 inch onslaught on the eyes and flaunts a hodgepodge of colorful mini-photos arranged in splashy, artful disarray captioned in dozens of fonts with as many exclamation points. Like Café brings its rendition of Hong Kong street snacks to 6205 18th Ave in Bensonhurst with a good assortment of Chinese, Thai, Japanese, Korean, Malaysian and Vietnamese offerings: noodles, dumplings, wings, rice dishes and sundry tids and bits scream for attention amid some lobster and sizzling beef contenders. 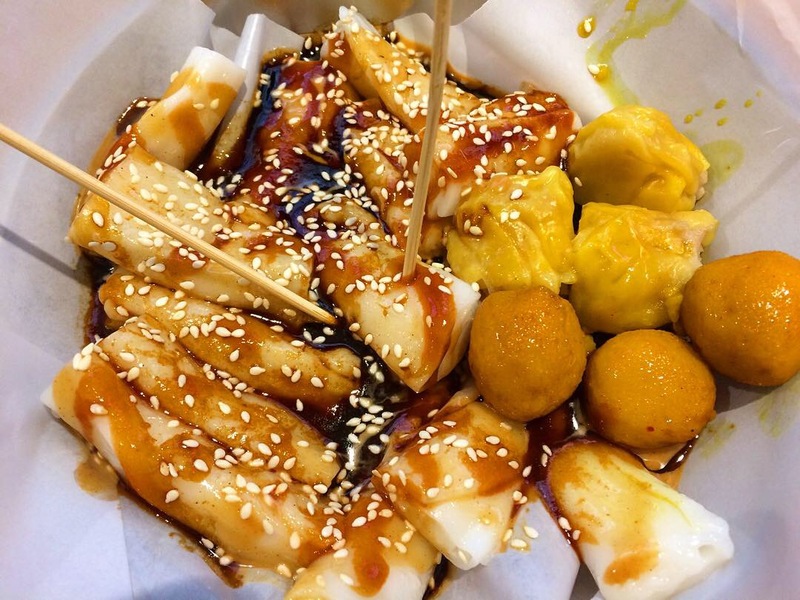 The first turned out to be rolled rice noodles, tiny fish balls, and diminutive, dense fish paste shu mei swimming in a sweet soy/peanut butter sauce topped with sesame seeds. The rice rolls and sauce were okay, the fish balls and dumplings less so. 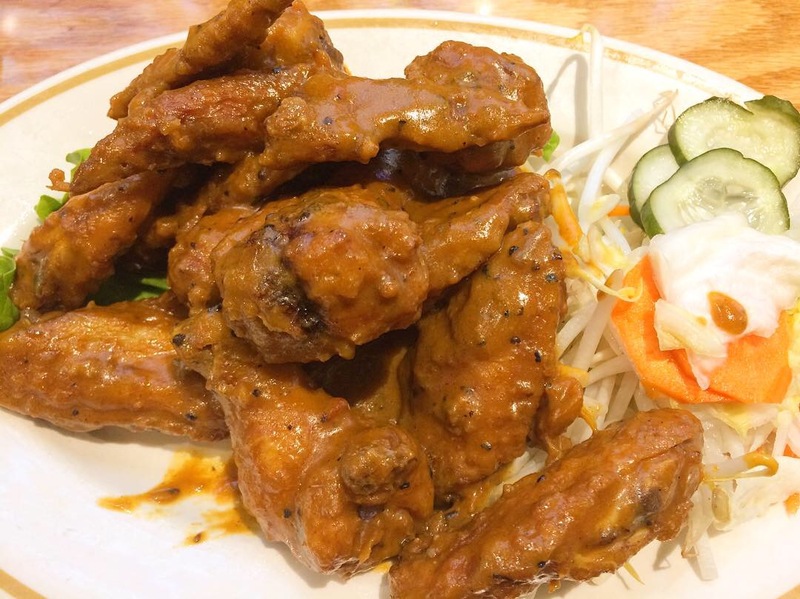 I like wings that are crispy and I also like wings that are saucy – not sure about the marriage however. These were spicy, a good thing, but when crispy crumbs get saturated, they lose their raison d’être. The sauce was chickeny, but I couldn’t tease out any other specific flavors. The pickled veggies on the side were good though. You’ve been waiting for Man Romance Rice, haven’t you? 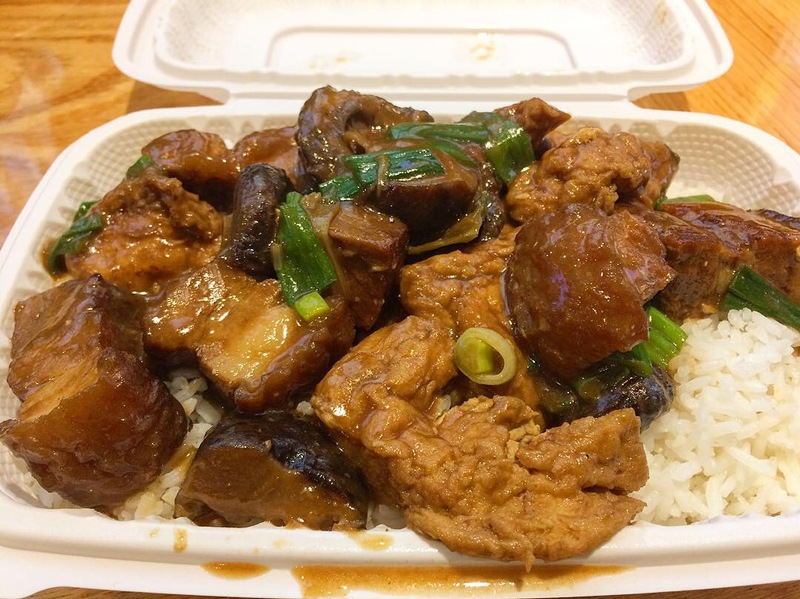 Possibly the best of the three dishes, it consisted of pork belly, bean curd skin, and thick meaty shiitake mushrooms in sauce over rice. Satisfying. And no, I didn’t ask about the name. Oh, how I wanted to love Like Café, but so far I only like Like Café. Despite what I’ve written, I’ll give them another chance – it’s possible that now that I have a sense of the place and based on other photos I’ve seen, with more judicious ordering it could prove to be a better experience. This entry was posted in Instagram, Restaurants & Food Courts and tagged Hong Kong by Rich. Bookmark the permalink.